How will the gaming industry evolve in the future? It is a tough question but it seems like one of the ways to improve gaming is hidden in the blockchain technology. Enjin coin seems to be one of the precursors of it. At the time of writing this article, ENJ price is rising and Enjin coin price predictions are very positive right now. Let’s take a closer look at ENJ value and price perspectives. Enjin is a promising and relatively new cryptocurrency launched on October 02, 2017. 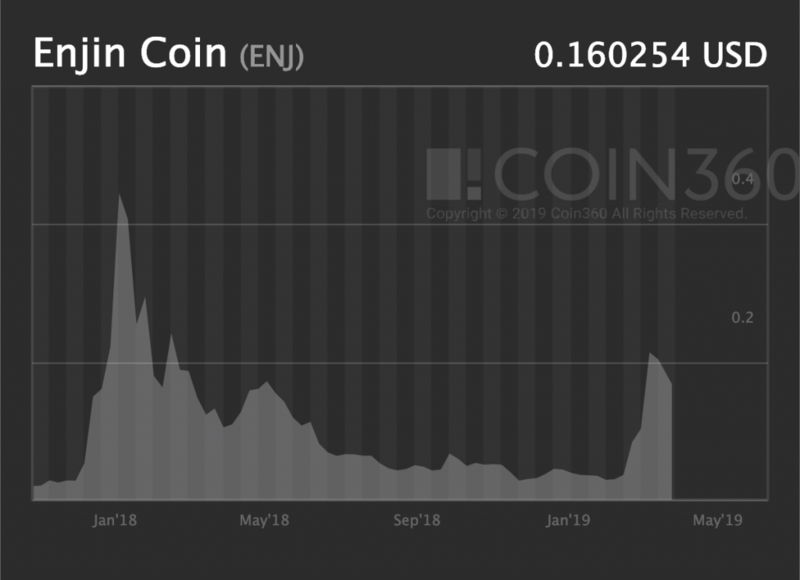 The Enjin coin price was initially driven by the crypto market rise of late 2017. Enjin was developed specifically for the blockchain-gaming industry as a platform to increase the quality of video games. Today, Enjin is one of the biggest blockchain platforms focused on gaming. According to the coin’s official website, there are over 20 million gamers currently registered in the Enjin network. Popular game design SDKs, combined with innovative blockchain structure provided the coin with a large user base. The following pole by Binance shows clearly that the coin is pretty popular in the community. The Enjin token is based on ERC-20 standard and is needed to perform transactions, implement smart-contacts and develop new in-game tokens. Enjin seeks to become a gaming platform with a low-fee network and entirely free from fraud. The development platform and its blockchain network are suitable to compose, launch and maintain various types of games. Let’s think how it may affect the future of Enjin coin price. Enjin exists for only around two years but already managed to become a prominent part of the market. Despite being a new asset, Enjin is ranked 49 in terms of market capitalization at the time of writing this article. Its current price peak was reached at the time of the overall market increase. The price record happened on January 7, 2018, and amounts to 0,44 USD per coin. However, unlike the other coins on the market, the current position of Enjin price is not as discouraging. In spite of the apparent downfall of 2018, the currency recently showed a rapid and sufficient increase in rate. Today, on March 27, you can buy one coin at the price of around 0,16 USD when the current price bottom was met at 0,022 USD at the end of 2018. The recent price growth was most likely caused by the news about the new partnership between the Enjin and Samsung. The story was that Samsung implemented ERC-20 tokens in its Galaxy S10 smartphone. During the presentation of the new product, the company showed several coins as examples of cryptocurrencies, supported by Samsung Blockchain Keystore. ETH, BAT, and ENJ were mentioned during the presentation. You can read more about it in the report from Cointelegraph. The price of the coin started rising immediately after several cryptocurrency media reported the rumors of the future partnership. It skyrocketed after the presentation and grew even more after the development team confirmed the cooperation. However, the coin currently loses gained positions as the hype goes down. This situation is interesting and very influential in terms of ENJ price predictions, considering the position of other coins. Even the most prominent cryptos and media-covered assets have no similar increases registered in 2019. Even the coins with very positive price predictions like BitTorrent Coin and Binance Coin didn’t show such impressive financial results, even though they also were actively covered in the media. Media coverage and audience interest are some of the most important factors behind any cryptocurrency price. Let’s take a look at Google Trends. It is clearly seen that the search interest reflects the coin’s price. Enjin was most popular at the time of its price record. The graph also shows that the coin recently significantly increased its media coverage. The development team of the coin helped to upgrade the coin’s search volume with constant attendance of the major conferences, talks, and meetups. Other important contributions were made by the Binance exchange and Changelly, yours truly. Let also go through the geographic distribution of traffic interest. Enjin coin is clearly crypto targeted at first world. Unlike Dash, which is a go-to solution to hide from bad government financial policies, Enjin is targeted on gamers and game developers. The coin has a user base that is mostly concentrated in rich countries. For example, Enjin is very popular in Slovenia, Netherlands, Croatia, Singapore, and Australia. By the way, Singapore is the country where the Enjin company is registered. Despite not being popular in Africa, India, South America, and China, Enjin is still a worldwide known crypto with growing popularity. The Enjin coin price predictions are divisive. Some portals are positive towards the Enjin coin’s future price. For example, Digitalcoin forecasts 0,3 USD in 2019 and 0,33 USD in 2020 with an ascending trend. Cryptoground also sees a positive direction, predicting the price of over 0,20 USD at the end of 2019. Other services are not as confident in their anticipations of Enjin price. WalletInvestor, for instance, used technical analysis to predict a significant price drop to 0,09 USD with no further growth. It is true that today is not the best moment to start investing in Enjin. The recent hype caused by Samsung S10 collaboration is fading away, and the price is also going down. However, the coin is one of the few cryptos that proved their ability to further its integration into the products of IT-giants. Such events significantly influence the price and fundamental value of the currency. The most likely price prediction for the coin is a gradual decrease in price for the following weeks or maybe months. After a slight drop, the currency most likely will rise in price. 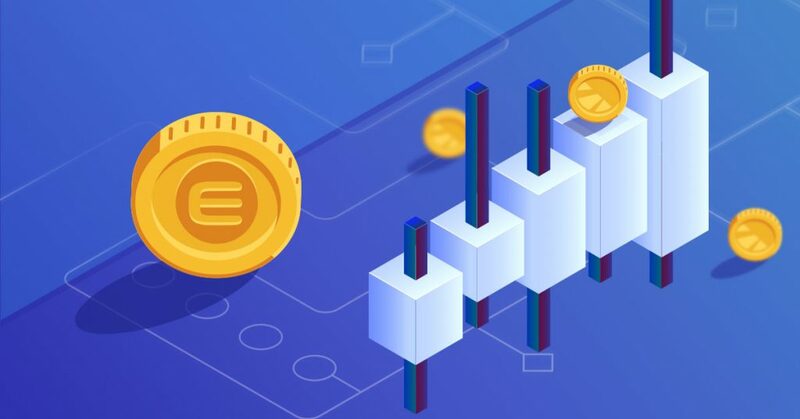 Our Enjin price prediction is 0,3 USD per coin at the end of 2019 and further growth in the following years. 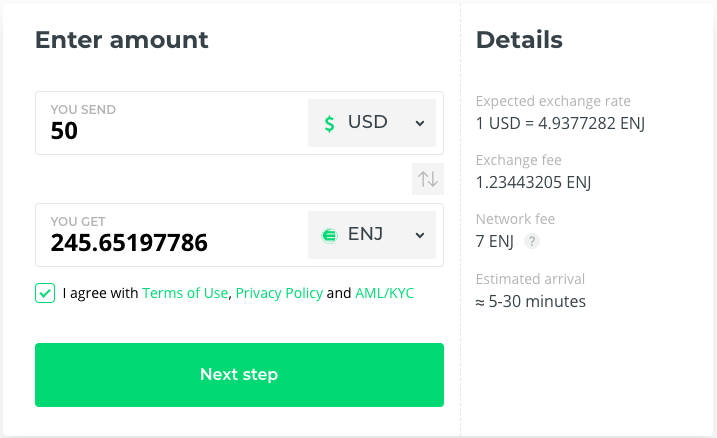 You can exchange Enjin at the best possible rate on Changelly. Next Post:Bitcoin Price Bull-run: Crypto Market “Weighs” More than $160 billion!